Please email me on info (at) disabledgear.com or use the Contact Us page. 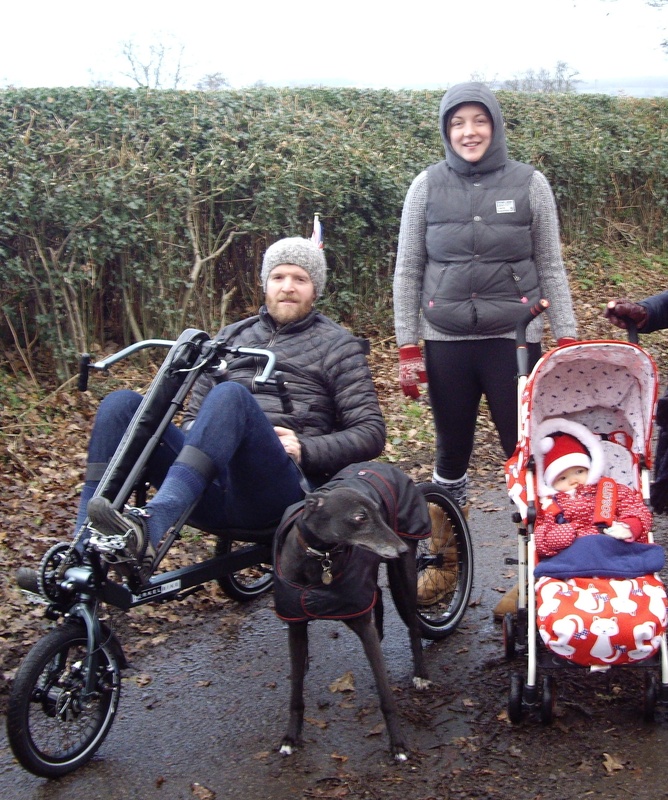 "As an MS sufferer of 15 years with limited mobility (I walk with two crutches) I was looking for a product that would enable me to get out and about with my young family and give my legs some sort of rehabilitation. I suffer from significant spasticity in my back and lower limbs and lack of exercise over many years had made the muscles weak and really limited their range of movement. I also suffer from tremor in the soles of my feet and ankles so prior to testing any products I was sceptical as to whether i'd actually be able to use a leg operated bike or not. Somewhere between a handcycle and a recumbent bike, which is both leg and arm operated, the beauty of Berkelbike is that it takes significant pressure off the lower limbs when riding (unlike static bikes in the gym) and i soon found that i was able to ride significant distances without getting any painful spasms/tremor. What's more, the bike (I have the Pro version) has foot plates with quick release straps and calf supports fixed by velcro, further supporting the feet and relieving the pressure on my sensitive legs while keeping them in good alignment. Something else I was concerned about prior to purchase was the sort of distances/gradients i'd be able to manage being so out of physical condition. The bike has 8 gears and i was pleasantly surprised to learn that this helped make relatively light work of small hills and gradients. I can regularly manage distances of up to three miles on the bike after only a month of use, whereas I struggle to walk 100 metres on foot. There is a robust parking brake just beneath the gear changer which also enables the user to rest without fear of rolling backwards. Steering is very smooth and simple with the handlebars and the brake is applied by reversing the direction of the handlebars. Handling is also smooth and relatively light though it does take a while to get used to speed when going downhill. The build quality seems really robust yet it's light enough to be moveable by someone with moderate to significant disability like myself. The bike comes in two parts (a front and back section) and is really easy to disassemble for transport with a quick release clamp, though I've yet to find a way of carrying it in the car that completely suits (we have a daughter and a greyhound so space is at a premium!). I also bought a Tacx static trainer with the bike which enables me to use it indoors - perfect for when the weather is poor or I'm just not up to going outside. Though I've only had the bike for a month, I've used it every other day since it arrived and am already noticing my lower limbs are significantly looser and less stiff. It is also helping reduce my fatigue, which can be such a blight on the everyday lives of MS sufferers like myself. My legs and arms are obviously tired and achey after using the bike but it's definitely got easier to use as the month has gone on. Most importantly of all, it's allowing me to get out and about in the fresh air with my family (see pic attached). Indeed, we've already got two family cycling holidays planned this year in Derbyshire and Normandy. Cost-wise, the BerkelBike is a sizeable investment, but already the benefits to me and my family are priceless. I can obviously only speak from an MS perspective but I know the product is being used in many different rehabilitation scenarios and I feel it's well worth a look for anyone investigating the handcycle market." Another useful resource for handbike reviews - infact the only one that I can find - is Handbike Scotland.